The Vintage Stage III cover design was first used on Safe House, Everybody Pays, and Choice of Evil. Subsequently all the books have been re-jacketed, and all are now published with the Stage III design. As every single title remains in print -- the paperback rights to Flood having been purchased by Vintage -- a complete collection of Stage III books is now possible. 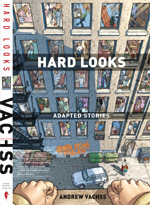 All Stage III jackets use the "thumbnail" size author's photo, except for the short story collections, which feature the author's photo as part of the cover design. The "thumbnail" did not appear in the first printing of Choice of Evil (due to compositor's error), but appears in all subsequent printings. None of those books with Stage III covers which were originally published in Stage I or Stage II versions will be "first" printings. Each rejacketed book begins where the old sequence left off. So, for example, when the Stage III cover of Born Bad replaced Stage I its first appearance was actually the eleventh printing of the title, as shown. Starting with Safe House, all covers going forward will be Stage III from inception, so printing history will be consistent on each. While the Stage III covers are available in stores and on the Net, the cyber-stores may still display the images of the older covers. Be sure to clarify which cover you will actually receive if you are buying from such sources. 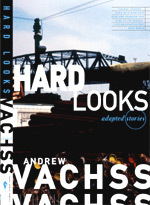 Hard Looks is meant to be a crossover tool, one that works in both directions. Adapting a number of Andrew Vachss' stories to the comic-book format, it's meant to bring his message to a different audience than reads his prose work. Likewise, it's meant to introduce readers of his prose to the comic-book medium. With two distinct audiences, there was a dilemma as to which direction to go with the cover design. Dark Horse publisher Mike Richardson came up with the solution: Go both directions. Geofrey Darrow was hired to design the comics store cover. He's legendary in the comics industry for his work on such graphic novels as Hardboiled and Big Guy and Rusty the Boy Robot, and has become the hottest thing in Hollywood for his work as the conceptual designer on The Matrix I (and the buzz about his work on The Matrix Reloaded, and The Matrix Revolutions has made an oxymoron of the phrase "whisper stream"). And no one but Geofrey Darrow could have come up with as elegant a solution to a cover that is meant to illustrate more than a dozen different stories! For the bookstore edition, the goal was a cover that allowed the graphic novel to stand alongside the Vintage trade paperbacks, tying into Evan Gaffney's thematic design that runs across the books. Alan R. Talman provided the photograph, and Kim Talman (of Dragon Lady's Web Designs, whose services keep The Zero coming to you every day!) provided the design. The result: A great cover that collectors of the Vintage trade paperbacks will want to grab to complete their sets. And finally, if you're looking to purchase signed copies of Andrew Vachss' books online … buyer beware!